This entry was posted on 01/11/2016, in Corruption and Cheat, News | Newsmakers and tagged Choi Soon-sil, Korea. Bookmark the permalink. This political scandal going on in South Korea now reminds this blogger (TW) many similar or near-similar scandals that drained Sri Lanka billions of rupees of hard-earned money belonging to its citizens. Read on…. 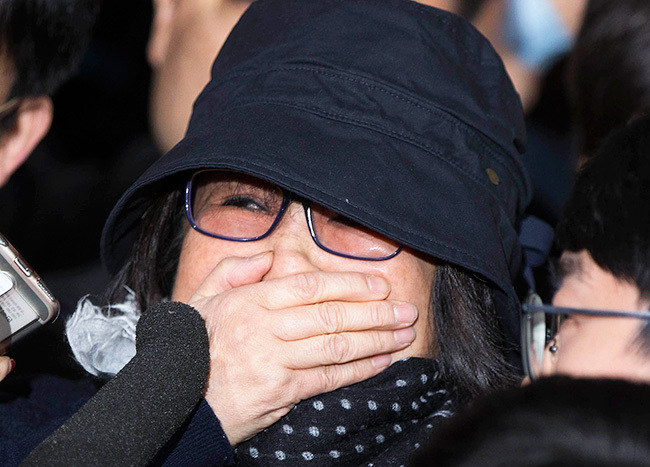 Choi Soon-sil, the central figure in the biggest influence-peddling scandal of the Park Geun-hye administration, appeared before the Seoul Central District Prosecutor’s Office, Monday. Covered up in a black hat, scarf and sunglasses, the 60-year-old arrived at the prosecution’s office a few minutes before 3 p.m. The prosecution and her lawyer had agreed to give her time to speak briefly before entering the office. However, immediately after getting out of a car, dozens of people rushed her and she found herself surrounded by hundreds of reporters and protesters. As Choi pushed through the crowd, her black Prada shoe abruptly came off. An official from the prosecution later brought it back to her, as she waited for the elevator inside. Her appearance at the office comes a day after her return from Germany via Heathrow Airport in the U.K. Since her arrival, many have criticized prosecutors for not summoning her immediately, saying she would use the time to destroy evidence and coordinate her story with others involved in the scandal. Speaking to reporters near the prosecutor’s office, her lawyer, Lee Kyung-jae, denied the speculation, insisting that there was no evidence to remove. Choi, who holds no official governmental post, is suspected of using her friendship with President Park to meddle in critical state affairs and benefit herself. For violating laws governing the security of presidential records and tax evasion, she faces about 10 charges that could put her behind bars for many years. The focus of the investigation is to find out whether Choi and a so-called secret advisory group had access to highly classified information and, if so, how much they interfered in the government’s decision-making process. Evidence shows that she was aware of the South Korean military’s three unofficial contacts with their North Korean counterparts in 2012, and peddled influence in appointing ministers and heads of some government agencies. The evidence was found in files and email on a tablet computer that allegedly belonged to Choi. JTBC, a local cable TV network, retrieved the computer first and handed it over to the prosecution. The Ministry of National Defense refused to confirm the information about the military contacts, but an inside source said the information was accurate. In a recent interview with the local Segye Ilbo newspaper, Choi claimed that she never owned the tablet computer and she does not even know how to use the device. But prosecutors have concluded that she lied, saying she is capable of using it and she actually has, as they found selfies and other photos of Choi and her friends. Choi as well as people who gave her such information could face prison terms of up to seven years for violating the security of presidential records laws. Choi, who allegedly used the Mir and K-Sports foundations as her personal banks, could also be prosecuted for embezzlement and breach of trust. Moreover, if she really forced major corporations to pay for the establishment of the foundations as widely suspected, she could be prosecuted for blackmailing them. The Federation of Korean Industries, the nation’s largest business lobby group, raised about 80 billion won ($72 million) in just two months to fund the two foundations. Prosecutors are also looking into the Blue K, a paper company that she allegedly used to funnel money away from the foundations. Much of the money is believed to have been moved to other paper companies she set up in Germany, which could be regarded as a violation of the law governing foreign exchange transactions. Many believe that her exploitation of the President’s authority is much more than has been disclosed. Most recently, she has been accused of taking advantage of confidential information from Cheong Wa Dae to make real estate investments. No one knows how much money Choi has, but the worth of her real estate alone is at least 20 billion won ($17.5 million). It is also unclear how she accumulated such a large fortune in the first place. Now, finding the truth behind all the suspicions surrounding Choi and her friends depends on the work of the prosecution. However, many remain skeptical about its commitment to the job. When the prosecution decided not to take Choi into custody upon her arrival in Korea, Sunday, giving her a day of rest before questioning, all opposition political parties and many civic groups immediately criticized the move. Ko Young-tae, 40, known as one of the members of the secret advisory group and Choi’s friend, was also called in for questioning twice over his alleged involvement. There have been suspicions that the tablet computer belonged to Ko, but when leaving the prosecutors’ office, he told reporters that he did not own the device nor had he seen Choi using it.